"Every policy now the Palestinians are enduring was practiced on the American Indian." The life of Russell Means, a warrior for the people, will be celebrated on Wednesday, Oct. 24, in Kyle, South Dakota. Means' piercing words and clarity of style on American Indian rights, placed him at the forefront of the struggle of the American Indian Movement that spans four decades. Means passed to the Spirit World on Monday with the Morning Star at 4:44 am, at home in Porcupine, South Dakota, on Pine Ridge, surrounded by his wife Pearl, family and friends. From tackling the BIA superintendent on the Navajo Nation during a citizen’s arrest, to leading the Columbus Day protests in Denver, to demanding that the Lewis and Clark Expedition leave South Dakota, to the formation of the Lakotah Republic in his homeland, Means was a symbol of the bold fearlessness of the American Indian Movement. Whether he was facing off with BIA officials in Washington, or confronting them on the Stronghold in the Badlands where Lakotas fled after the Massacre of Wounded Knee, Means symbolized the AIM stance of never backing down. Means fight for human rights extended beyond the Occupation of Wounded Knee and the US borders, to solidarity with Palestine. Although Means was hospitalized with cancer and unable to speak at the recent Russell Tribunal on Palestine in New York, his stance was clear. Means said what is happening now to Palestinians is what happened to American Indians. "Every policy now the Palestinians are enduring was practiced on the American Indian," Means said in an interview. When Bolivian President Evo Morales took the lead in global climate talks, the defense of Mother Earth, and upholding the Rights of Nature, Means said, "This is what tribal councils should be doing." During his lifetime of fighting for justice, Means demanded that the US honor treaties and return stolen lands. He said the only people who get ahead are those who sell out to the colonial system. He said the United States does not want to be reminded of the smallpox blankets, theft, colonialism and mistreatment of the American Indian. Further, he said most Americans do not realize that the financial collapse of this country is only beginning. Americans cannot continue the lifestyles of consumers when there is no money. Means said Indian lands have become open air concentration camps. "If you chose to stay on the reservation, you are guaranteed to be poor, unless you are part of the colonial apparatus set up by the Bureau of Indian Affairs, set up the United States," he said. On Indian lands, everyone fights to be part of the tribal governments because that is where the money is. Everyone fights to be part of the colonial system. "The only way you can be part of the colonial system is to obey." "Our grandmother the Mother Earth is tired of the human race." I wish I was there to talk with you in person and share with you the sorrow that I feel with the passing of Russell Means, my brother, my friend, and inspiration on many levels. 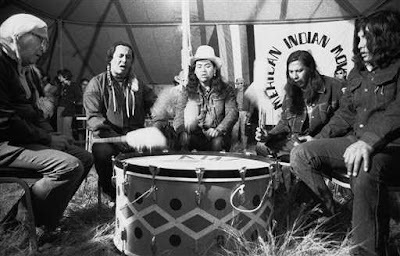 Russell Means will always be an icon whenever the American Indian Movement is spoken of and whenever people talk about the changes that took place, the changes that are taking place now for Indian people. One thing about Russell I always remembered, and I think someone else once said it, you may have loved him, or you may have disliked him, but you couldn't ignore him. I'll always remember when an elder said one time, I was at a ceremony and I asked what this half shaped moon circle on the ground meant, and he said it was a symbol of the circle of life, the never ending of the circle of life, and I said there is only half a circle, and he said the other half was unseen, it is the spirit world. For Indian people it never ends, we don't have a linear existence, so I know I will see Russell again, and I take comfort in that thought. For men like Russell Means don't come along in a lifetime very often. He was truly an inspiration for all of us younger guys at the time. He had good words to say, he was eloquent when he spoke them, and he spoke English as clearly and precisely and as articulate as any one I have ever heard speak. And he knew what he was talking about. And I know all of you out there, as well as myself, will always remember our friend, our brother and fellow activist, and how he stood with us to recapture the freedoms we've lost, and protect the ones that we still have, and bring about a better future for our people, and all people of this Mother Earth, who's nature is in peril. I really don't know what else to say about our brother Russell, other than to Russell himself, "We'll see you again my brother Russell, in some other time and in some other place, we will always be your friend, and we will always look forward to seeing your face. Mitakuye Oyasin." In the spirit of Crazy Horse, and Russell Means. The family of Russell Means invites you to join us in “Honoring the Life of Russell Means." The honoring will highlight his life, leadership and the eternal fire that he re-ignited throughout Indian Country. October 24, 2012, begins at 10:00 a.m. to 10:00 p.m. MST, at Little Wound High School Gymnasium in Kyle, South Dakota USA, on the Pine Ridge Indian Reservation. Russell Means, a self-described “Oglala Lakota Patriot and Freedom Fighter," began his journey to the spirit world at 4:44 am, with the Morning Star, at his home and ranch in Porcupine. This Honoring will be the first of four opportunities for the people to honor his life. The next three Honorings are tentatively scheduled as follows: 2nd Honoring at Wounded Knee’73 Occupation Memorial (Feb 2013); 3rd Honoring at Wind Cave State Park, SD (June 2013); 4th Honoring on Russell’s birthday (Nov 10, 2013) at location to be determined. There will be a designated media area at the Honoring on Wednesday at Little Wound School. Press credentials required. Contributions of star quilts, blankets and food to feed the people will be appreciated, and may be brought on Wednesday, October 22, directly to Little Wound High School, Kyle, South Dakota. Once again, the occupation government of the United States of America has trotted out its dogs and ponies to provide a smokescreen and diversion from its continuing crimes against the indigenous peoples and nations of the Western Hemisphere. The reason for today’s media spectacle is supposedly for the US State Department to “listen” to input from indigenous peoples and nations for inclusion in the U.S.’s report to the United Nations Human Rights Council, universal periodic review process. As we can see, many indigenous people have been duped to participate, yet again, in a lying and duplicitous process of the United States. The United States has absolutely no interest or intention of admitting to the world its human rights record that is neither justifiable nor defensible. In particular, the record of the United States with regard to historical, and ongoing, violations of over 370 treaties that were negotiated and signed with indigenous nations must be, but will not be, addressed by the United States. Instead, as is its ongoing practice, the United States will use this session, and the one tomorrow on the territory of the Diné (Navajo) Nation, as its justification that indigenous peoples were “consulted,” and “listened to,” while the U.S. simultaneously lies to the world about its disgraceful human rights record. The Republic of Lakotah will not legitimize this embarrassing process. Instead, we will submit our report directly to the UN Human Rights Council, not to be filtered or sanitized by the State Department. Let us be clear, our report will be scathing. The United States continues, on a daily basis to violate the terms of the 1851 and 1868 Fort Laramie Treaties with the Lakotah. Our report will indicate that the United States never intended to abide by the terms of the treaties, and has violated them consistently from the time of their signing to the present. Our report will also cite the United States’ own language in acknowledging that “the treaties retain their full force and effect even today because they are the legal equivalent of treaties with foreign governmentsand have the force of federal law.” Periodic Report of the United States of America to the UN Committee on the Elimination of Racial Discrimination, April 23, 2007, paragraph 335. In light of the United States’ own admissions, in addition to reporting to the Human Rights Council on the egregious human rights record of the US towards indigenous peoples, the Republic of Lakotah will report to the Council and to the world, the exercise of its own rights under principles of international law. The United States has continually breached the treaties with the Lakotah, and international law allows the Lakotah to return to our status quo ante position prior to the signing of the treaties. On March 30, 2010, the Republic of Lakotah will repeat its position to the United States, and will transmit its communication to the President of the United States and to the Secretary of State, demanding that the United States cease and desist it activities in Lakotah territory, and insisting that the United States withdraw its presence from our homeland.